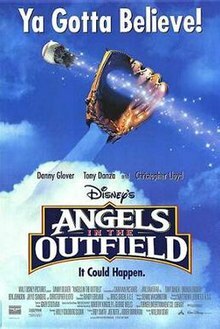 Angels in the Outfield is a 1994 American family sports fantasy comedy-drama film that is a remake of the 1951 film of the same name. The film stars Danny Glover, Tony Danza and Christopher Lloyd (the two latter actors previously worked together on Taxi), and features several future stars, including Joseph Gordon-Levitt (in the lead), Adrien Brody, Matthew McConaughey, and Neal McDonough. It spawned two direct-to-video sequels, Angels in the Endzone and Angels in the Infield. The film was released less than a month before the 1994 MLB Baseball Players Strike, which forced the league to cancel the playoffs and the World Series. Young foster child Roger and his friend J.P. love to sneak into baseball games of the hopelessly dreadful California Angels. Still in limited contact with his widower father, Roger asks when they will be a family again. His father replies sarcastically, "I'd say when the Angels win the pennant." Taking his father's words literally, Roger prays for God to help the Angels win. After he prays, a star, unseen by Roger, twinkles in the sky. Then, in a game against the Oakland Athletics which Roger and J.P. attend, he sees a group of angels led by Al helping the team. Although Roger can see them quite clearly, everyone else can only explain the seemingly impossible acts as freak occurrences. Roger's unique ability to see which players are receiving help from angels leads their skeptical manager, George Knox to keep him around as a good luck charm and consultant, including ending the use of profanity as a nod to the original film. Due to the much needed help, the Angels start to win games and make a surprising second-half surge to the top of their division. Meanwhile, Roger's father permanently gives up custody of his son, believing it's in Roger's best interest. As Roger laments his loss, J.P. accidentally reveals to antagonistic sports broadcaster Ranch Wilder that Roger has the ability to see angels, and that George has been winning through the advice Roger's given him. Hoping to destroy George due to a longtime rivalry between the two, Ranch informs the press of this and their owner Hank Murphy threatens to relieve George of his management responsibilities. Roger comes clean to his caretaker Maggie Nelson about his special ability and at a press conference they and the entire team defend George in front of the press. Moved by their faith, Murphy allows George to remain as manager of the Angels. During the championship game none of the angels show up to help the team. Later on, Al explains that championships must be played without help from the angels and that he was there just checking on pitcher Mel Clark who will be one of them soon as he has been a chain smoker. Mel starts struggling, and is getting tired after throwing 159 pitches. When George goes out to the mound, everyone thinks he's going in to take Mel out, but instead, George gives him some motivation, and with encouragement from Roger, the team, and finally, the entire stadium audience as well as owner Murphy and the broadcasters. The Angels ultimately win the final game of the regular season without the help of the angels and clinch the division pennant over the rival Chicago White Sox, thanks to Mel. Murphy dismisses Ranch because of his denigration of the team. The film ends with George adopting both Roger and J.P. as he wants to try be a father. J.P. sees Al at the window and says "I knew it could happen." Al circles around the house and says "We're always watching" and flying off into the stars, which re-enact a baseball game. Milton Davis Jr. as J.P. The film has a rating of 35% on Rotten Tomatoes based on 20 reviews, with an average rating of 4.2/10. Unlike the original film, which focused on the Pittsburgh Pirates as the team in heavenly need, the 1994 remake focuses on the California Angels, who did not exist when the original film was released in 1951. Some scenes in the original film were shot at Wrigley Field (Los Angeles), home of the original Los Angeles Angels (PCL) of the Pacific Coast League. The Walt Disney Company, which distributed it, was a minority owner of the Angels at the time. The film did, however, premiere at the Pirates' home stadium at the time, Three Rivers Stadium in Pittsburgh. The premiere would be the only reference to the Pirates, due to the two teams playing in separate leagues (Angels in the American League, Pirates in the National League) and the film being released three years before the start of interleague play. The two teams would finally meet head-to-head for the first time in 2002 in Anaheim. The film opened at #4 at the North American box office, making $8,916,463 USD in its opening weekend. It went on to gross $50.2 million at the box office domestically. ^ a b "Angels in the Outfield – PowerGrind". The Wrap. Retrieved July 29, 2017. ^ "Angels in the Outfield (1994)". Rotten Tomatoes. Retrieved October 27, 2016. ^ Vancheri, Barbara (January 24, 2003). "Multi Media: Adrien Brody going darker and deeper". Pittsburgh Post-Gazette. Retrieved August 21, 2009.